In conjunction and collaboration with Botanica Celebration, where I have two paintings on exhibition, the Art Gallery of NSW is also showcasing botanical art for the first time. A small exhibition of selected artists’ work is hanging in the Members Lounge from March through May 2019. Two of my paintings are in the building! It’s an honour to have my painting of a small Australian native shrub, Styphelia triflora Pink Five Corners, hanging with a painting by Margaret Stones, one of Australia’s foremost botanical artists. Snipits of latest paintings, projects and things I love. The June 2016 issue of Landscape Architecture Frontiers centred on the theme ‘Habitat and Biodiversity’. As part of this issue I was invited to discuss my work and relationship with the North Head Sanctuary, one of the last remaining areas of Eastern Suburbs Banksia Scrub (ESBS) in the heart of suburban Sydney. My article, ‘Bushland Beckoning’, discusses my work within this landscape, the species that inhabit this, and how this has informed my journey as an artist. The full article can be downloaded here: Julie Nettleton -LAF 160628. This international journal is produced by the College of Architecture and Landscape Architecture at Peking University, China. 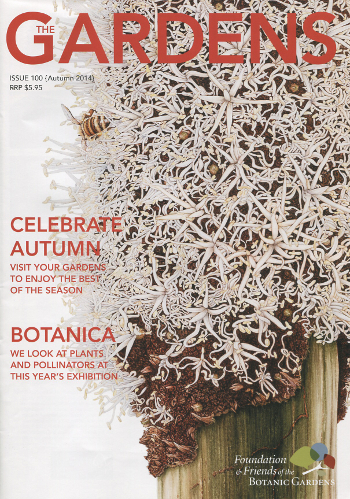 As part of the The Royal Botanic Gardens Sydney’s bicentenary celebrations, this June 2016 The Florilegium Society published the book The Florilegium: The Royal Botanic Gardens Sydney. This work is a major collection of contemporary botanical illustration, featuring the artwork of sixty-four artists, including my own. Forty-one Australian and twenty-three overseas artists have contributed by invitation one or more works of significant plants in the three Sydney botanic gardens. The paintings will be exhibited at the Museum of Sydney from July to October 2016, and at the Shirley Sherwood Gallery at the RBG, Kew, during the first half of 2018. Julie Nettleton with her award for Best Botanical Painting for Xanthorrhoea resinosa Pers., Grass Three with Antechinus Stuartii , Brown Antechinus at the RHS London Botanical Art Show 2016. Celebrating the world’s best botanic artists. Copyright RHS. Each year the Royal Horticultural Society hosts their annual botanical art exhibition – featuring the work of leading contributing artists from across the world. This year the London exhibition featured the work 33 international artists and over 200 paintings. Julie’s six-painting series, a study of the Grass Trees, featured in the exhibition and was awarded a gold medal. Her painting Xanthorrhoea resinosa with Antechinus stuartii (native marsupial mouse) was awarded Best Botanical Painting in show. 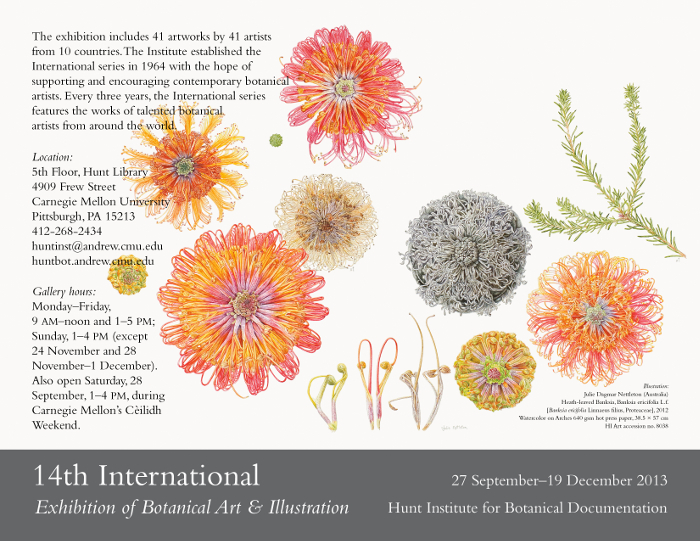 In the Spring of 2013 The Hunt Institute for Botanical Documentation, Carnegie Mellon University, Pittsburgh Pennsylvania, held its 14th International Exhibition of Botanical Art and Illustration. My painting of Banksia ericifolia, Heath-leaved Banksia, was selected for the cover of the exhibition catalogue and promotional material. 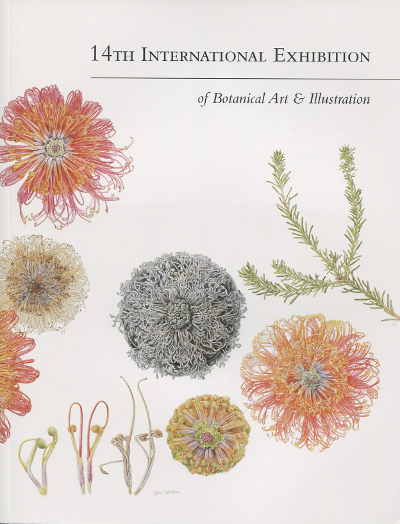 Collectively, the exhibition catalogues contain the most comprehensive record available of 20th and 21st century botanical artists and illustrators.